I started a conspiracy to harm Her Majesty’s Government of the United Kingdom of Great Britain and Northern Ireland (HMGUKGB&NI). It was a petition to make the UK Government respond or debate the question of appearing before the International Court of Justice and allowing it to rule on the case of the Chagos Archipelago. At issue is the terrible injustice to the Chagossians and their descendants who were arbitrarily evicted from their homeland with trickery or brutality. It was the US that decided the negative repercussions of this crime were a reasonable price to pay for a completely depopulated archipelago in which to put a naval and air base. The US gave the order to their British subordinates in a now notorious 3 word telegram: “ABSOLUTELY MUST GO”. At issue also are the rights of Mauritius. The UK broke international law by detaching Chagos in the lead-up to decolonisation but refuses to have the question adjudicated. Her Majesty’s Government takes the position that Chagos will be returned to Mauritius once the islands are no longer required for “defence” purposes. So far they have “needed” Chagos for 50 years and there is absolutely no reason to believe that they will not “need” the military base on the island of Diego Garcia for another 50 years. The plight of the islanders, who continue to live in deprivation, is a worthy cause, but we allow it to distract us from what is most important. Our natural sympathies and our psychology as activists is used to make the issue into a lightning rod. We pour our energy into that, and the UK Government directs it safely away from its edifice of imperial violence. Ultimately this is not only turning our backs on the victims of US military violence, it is also useless to the Chagossians. The fact is that no one can argue against the proposition that an injustice was perpetrated against the Chagossians, but they and their supporters are forced to fight the same battle over and over again, and each time they win it gains them nothing. To understand why we need to understand that human rights discourse is dominated by establishment voices who are unquestioningly subservient to power. Considering the crucial importance of the military base for the USA and having in mind all the conflicts that are currently taking place in the Middle East and Asia and those that might be coming soon, it is difficult to believe that even if the Chagossians win again, they would be allowed for real to resettle the islands again. The case of the Chagossians is interesting precisely because of its complexity and the many factors that have to be taken into consideration when examining it: the interests of both American and British governments, international politics, diplomacy and security, are most certainly factors that could not just be disregarded. So how do human rights enter the picture? Are they taken into consideration when they are opposed to international security? Could they change the course of events? They should definitely influence it. And here comes the question – is something as important as international security worth risking, so that human rights are not violated? This creates a false dichotomy between human rights and “international security”. The author clearly cedes precedence to security as the superior concern, but without devoting even a single atom of examination to what it might mean. The embedded presumption is that the US and UK can unilaterally decide what constitutes “security” and that their actions are necessarily in favour of “international security”. On a very basic level this violates logic by suggesting that killing people and wreaking destruction in a region geographically distant from both countries is somehow in the service of “security” when there can be no immediate threat from the victims of that violence and destruction. If that basic flaw is unconvincing then there is the fact that US/UK interventions in the Middle East, North Africa and Central Asia seem to have spawned incredible amounts of insecurity. If “security” is defined as being the physical security of human beings, or even UK citizens, it seems quite a stretch in these times of instability and crisis to say that US/UK military actions have been in the service of security, but to simply stipulate that this is the case without even giving some form of argumentation is ludicrous and unforgivable nonsense. The political discourse of UK foreign affairs relies on unchallenged assumptions and areas of inquiry where silence is enforced. Like their US counterparts the UK establishment cultivates and inhabits a world of parochial narrow-mindedness and mirror-blindness where they never need to ask themselves why they consider it their right to take lands and resources from others by force. The assumptions are based on exceptionalist notions that presume a fundamental benevolence of nature and benevolence of purpose as the foundations of Western civilisation. These assumptions take on the character of articles of faith and challenges to those articles are greeted with hostility as being heresy. For those that would oppose unjust actions by HMGUKGB&NI it is made much easier to challenge on narrow grounds by suggesting that a particular crime is an exception, while they affirm the rule. That is why it is acceptable to criticise the UK for injustices perpetrated on the Chagosians or even on Mauritius, but it is not permissible to state that their purposes in doing so are themselves criminal, arrogant, imperialistic, militaristic, illegitimate and morally repugnant. In fact even bringing up the subject is offensive, because the facts are so clear. The UK has no right to be in the Indian Ocean and no right to use territory there in support of killing people in the Middle East and Africa. 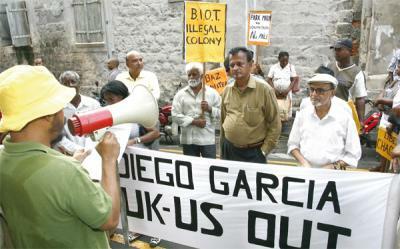 It is easy to see, therefore, why well-meaning people are attracted to the easy option of treating the issue of the Chagos Islands as separate from the acts of mass violence that are facilitated by the base at Diego Garcia, but it becomes a trap, The callousness of the treatment of those deprived of a homeland is infuriating and exasperating by design. Both openly and behind closed doors officials will fight every step of the way to avoid any admission of wrongdoing. They will make challengers fight and fight for every little admission and then finally, when the time is right and the fullness of consciousness is invested in the blatant injustice, they will admit regret and cite “strategic necessity” for “defence purposes”. In practical terms neither an individual nor a movement can change track at that point. Leaders of the cause, such as crusading parliamentarians, will effectively be subverted or left in a halfway position of campaigning to moderate rather than end overt wrongdoing. At the same time the voices of the dead of 50 years of mass killing cry out. 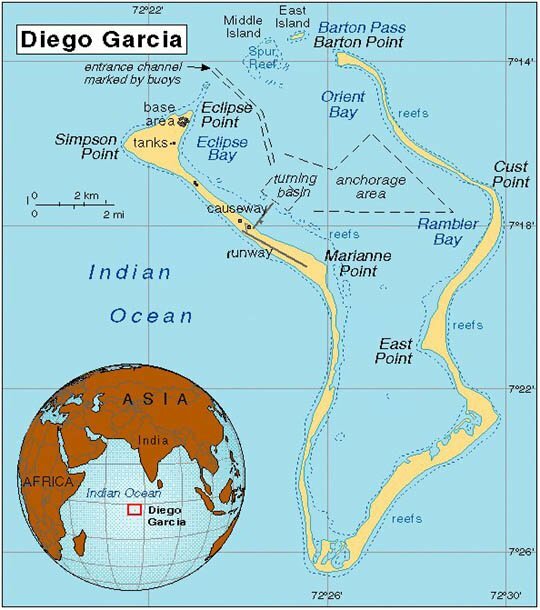 Diego Garcia is a base for long-range cruise missiles and bomber aircraft as well as communications and logistical support. Even leaving aside the questions of its naval and nuclear role, it is the source of incalculable death, destruction and suffering. This is not potential or theoretical. Another 50 years of “defence purposes” will mean hundreds of thousands killed. The very nature of the weapons systems is such that “defence purposes” can only mean imperial aggression. These are true weapons of mass destruction. Despite pretences, they are not and cannot be used in a pure military sense against a chosen Hitler-of-the-month dictator and their armies, they are weapons that attacks “peoples and nations” – which is the original defining trait of genocide. Since the end of World War 2 the most indiscriminate and obscene weapon of war to be used has been the B-52 bomber. After smaller aircraft and ground artillery had had created a 20 km traffic jam on the Mutla Ridge early in 1991, it was B-52s which carpet bombed those trapped there, massacring them in a period of hours. This became known as the “Highway of Death” and the B-52s which were responsible for the slaughter flew from Diego Garcia. Most B-52s that flew in the 1990-1 “Gulf War” were based in Diego Garcia. The near obsolete bombers dropped one third of the aerial tonnage and every time they dropped ordnance it was, by the very nature of the weaponry, a war crime of disproportionate and/or indiscriminate killing. B-52s were used from the first night of the war to the last. Flying at 40,000 feet and releasing 40 – 60 bombs of 500 or 750 pounds each, their only function is to carpet bomb entire areas. … B-52s were used against chemical and industrial storage areas, air fields, troop encampments, storage sites, and they were apparently used against large populated areas in Basra. This was the opening of a period of genocide against Iraq. In 1998, during the sanctions period which was estimated in 1996 to have cost 500,000 children’s deaths, B-52’s from Diego Garcia launched 100 aerial cruise missiles as a major part of Operation Desert Fox. While officials, wonks and security studies hacks are triumphal about the efficacy of strikes against “regime” targets this comes from the long-standing habit of conflating civilian and military targets. The patently false stated aim of Operation Desert Fox was to “degrade” the mythical WMD programme. The targeting of “command and control”, WMD industrial and “concealment” sites, and the Basra oil refinery were all deleterious to the people of the stricken country. Only retrospectively did the think-tank pundits decide that the real aim must have been regime destabilisation not WMD, but as with the sanctions inflicting misery and hardship on Iraqis only strengthened the governing regime. From 600-2000 civilians died along with an unknown number of military personnel who were attacking no one and had no chance to defend themselves or fight back. In 2001, Diego Garcia was the most important base in launching attacks on Afghanistan. This was a high-altitude no boots-on-the-ground approach by the US which led predictably to a power vacuum, rampaging warlords, insoluble instability, refugee crisis, food insecurity and everything else we have since seen unfold. Like Iraq, the country is being slowly tortured to death. In 2003, Diego Garcia was once again central to US efforts against Iraq. Readers are probably somewhat familiar with what has happened in the area since. Diego Garcia has never had legitimate “defence purposes”. It is a strategic asset of empire and it is used to maintain control over the Middle East, South Asia and parts of Africa. The base is there primarily for the purpose of killing large numbers of people at once when other means of exerting power are unsuitable, undesirable or unavailable. Its role is distinctly and inescapably genocidal. Here’s the thing: it is difficult for activists to recruit people by accusing the government of war crimes, let alone mass-murder and genocide. A web search will show that even antiwar websites and writers tend mention Diego Garcia’s role in bombing only in passing while focussing either on its role in torture and “extraordinary renditions”, or on the injustice perpetrated against the islanders. It is easy to see why the plight of the Chagossians appeals in the same way that seeing rabbits tortured in testing cosmetics was so rousing in the 1980s. The moral dimensions of the issue are readily apparent and very few people need to re-examine their ideology, challenge their beliefs, or question their loyalties. The Chagossian cause is just, but it is not right to ignore other crimes which are even more monstrous. It is not right, and it is not wise. Without undermining the “strategic necessity” argument then there can never be a victory. The Chagossians have already won in court – several times – but they remain in exile. Why? Because “defence purposes”. People may not want to hear the truth about imperial aggression and the suffering inflicted in their names, but they can at least understand that giving the US a base in the Indian Ocean from which to bomb people has not made the United Kingdom in any respect safer. No one can suggest that carpet bombing Iraq reduced the threat of terrorism or Saddam’s WMD. If we do not accept that there are valid “defence purposes” then there are no legally or morally valid “strategic” reasons for keeping the Chagos Archipelago. That is something that we must always bear in mind when working in this cause – there is no strategic justification and the UK has no right to be there at all. The cause of Mauritius is also just. They are the rightfully sovereign country deprived due to “strategic” decisions taken in 1964-5 which were no more defensible than the depopulation decisions of 1970-1. Mauritius recently won a case against the UK in the Permanent Court of Arbitration, but the UK denies the jurisdiction of the court and the court cannot rule on the issue of sovereignty. Mauritius is taking the case to the International Court of Justice for an “advisory” ruling, but that is only as good as the publicity it generates. They need allies, especially among UK activists who can keep the issue on the agenda at home. For this reason I contacted Mhara Costello, an activist and poet who uses the pen name Tamerishe. Along with her poem “Once Upon a Palestine” she also wrote “Just a Word” which deals with the abuse of the term “terrorist”. It seemed an appropriate qualification. We formulated a petition that would incorporate a direct challenge to the narrative frame which ensures that critiques always remain atomised, specific and isolated – hermetically and prophylactically sealed away from infecting the self-righteous self-love of civilised Britons. HMG should agree with Mauritius to an ICJ case regarding the Chagos Islands.The Republic of Mauritius claims sovereignty over the Chagos Archipelago, but that claim is disputed by the UK. If the UK government agrees the International Court of Justice can hear and judge the issues as a “Contentious Case” in accordance with international law.At issue is more than sovereignty. The UK forcefully removed the inhabitants of the islands and leased Diego Garcia as a US military base. The treatment of the islanders is cruel and unjust, and has been ruled unlawful. The US military base sends bombing sorties which cause countless deaths and may constitute crimes of aggression or terrorism. The base is also implicated in torture, illegal rendition, and concealment of illegal munitions. More at:http://johnpilger.com/videos/stealing-a-nation. Dear Mhara,Thank you for your email. I apologise for the length of time it has taken to process your petition. We can accept the central request of your petition, but we cannot publish the second paragraph because it does not comply with our rules. This means that your petition would read:HMG should agree with Mauritius to an ICJ case regarding the Chagos Islands.The Republic of Mauritius claims sovereignty over the Chagos Archipelago, but that claim is disputed by the UK. If the UK government agrees the International Court of Justice can hear and judge the issues as a “Contentious Case” in accordance with international law.If you could let me know that you are happy with this, we could publish your request immediately. No, I am not happy removing the second paragraph. I would be willing to amend it. Can you be more specific please, regarding your objections? In what way does the petition not comply with the rules? Please cite which rules have been breached? I am unable to identify any (inadvertently) I may have overlooked. We cannot publish the second paragraph of your petition, because we have not been able to establish that the very serious allegations you make are true. I hope you will understand that we cannot publish allegations of unlawful conduct. We would be happy to look at alternative wording for this paragraph, if you would like to propose some. It would need to be worded moderately and fall within our rules. You might reasonably say, for example, that many people believe that the former inhabitants of the Chagos Islands have been very badly treated by the Governments of the UK and the USA, and that this ought therefore to be examined by the ICJ. They are saying that you can’t detail allegations that you want addressed in court, because you have to prove the truth of the allegations before petitioning to have the matter adjudicated. This response is a bureaucratic Catch-22 piece of nonsense. It must be assumed that, as intended, the petition itself is troubling. The offending paragraph deliberately broadens the issue as much as possible within the character limit. One petition is unlikely to really shake the UK establishment, but it may yet frighten them because it takes matters into a realm which they cannot control. What is more, there is a hook in it. When they commit crimes or act unjustly the greatest vulnerability of the authorities is their perceived legitimacy. When they are forced to overtly display illegitimacy it breaks their support structure. Even in the face of mass popular condemnation, a government can act with blatant injustice as long as they have a cover story – a lie which, however unconvincing, allows those who really want to give them unconditional support to believe in benign intent or even the ineffable divine schemes of “security”, which lie beyond mortal ken. In this case the UK might be in an awkward position if the question were debated because it does not want to negotiate directly with Mauritius. To explain why they do not wish the matter adjudicated by the ICJ the UK government might either have to say it prefers bilateral talks or it would have to say that it does not think its actions should be subject to adjudication under international law because “defence purposes”. That would bring the spotlight back onto the criminal uses of the criminally acquired Chagos Archipelago. Right at the moment the “perceived legitimacy” of the UK government may already be close to breaking. Foreign entanglements must surely seem even less attractive to the UK public than February 2003, when a million marched in London to protest the looming invasion of Iraq. The sordid aftermath of shame from that act continues while the ongoing Balkanisation of the oil rich Arab world is surely one of the most inglorious blood-lettings in the unpleasant history of conflict. Even for those who do not understand that US/UK intervention created the fractures and fervour that wrack the region, it is hard to see any nobility in backing the Saudis, the Israelis and the “moderate” forces that fight alongside al-Nusra. Meanwhile, the establishment seems to have to put the UK public in its rightful place of silent subjugation more often than it would normally need to. It seems that every time that there is a popular consensus in the general population or some significant segment of it, they need to be reminded that their democratic voice must be conveyed through a mediating wah-wah pedal that is under the foot of their social superiors. Whether it is giving Thatcher an appropriate send-off, or naming a sea-vessel, or when Labour Party members mistakenly choose a leader whose views coincide with those of ordinary people. Much more of this and people will start demanding that the hollow sham of modern democracy have some populist stuffing shoved back in it, and once government’s start giving in to popular demands it just encourages more; things could spiral out of control and before you know it you are dealing with a sovereign self-emancipated people who do not want a society run by and for a controlling greedy and/or power-obsessed few. That is why even an e-petition can frighten Her Britannic Majesty’s mighty Royal Government. They need people to continue to be their own worst enemies. They need people to sabotage their own efforts. They need people to think that those within the establishment have a greater understanding of issues and how to tackle them. They need them to make their own protests against specific injustice into an embrace and an endorsement of the system itself. Let’s show them that we won’t play that stupid game any more.